This article appeared in the Winter 2011-﻿12 edition of The Wild Times. A full copy of that issue can be found on our Newsletter webpage. Unless you've been living in a cave these last few years you will have heard about the killer fungus that causes White Nose Syndrome and it's deadly march across the Eastern United States. But wait, if you'd been living in a cave, you might well be dead. 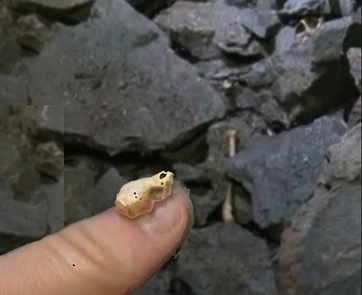 Pseudogymnoascus destructans, the fungus that causes White Nose Syndrome (WNS) is possibly the most deadly disease to hit wildlife in the United States and is causing one of the most precipitous wildlife declines in recorded history. WNS has killed millions of bats and every year pushes westwards leaving thousands more dead in its wake. The classic appearance of White Nose Syndrome on a Little Brown Bat. Photo Credit: Ryan von Linden/NY Department of Environmental Conservation). The Little Brown Bat, once the most populous predator in the United States, is now threatened with extinction in perhaps as little as a decade if WNS is not stopped. And so far, five years after its appearance, no one knows how to stop this fungus and how to help the bats affected and threatened by its virulence. In March 2007, New York biologists were surveying a cave near Albany when they came upon an eerie sight. "There are dead bats everywhere," they reported. 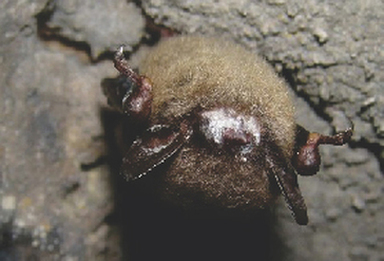 In 2008, a 2006 photograph taken by a spelunker clearly showed a white-nose-afflicted bat in Howe Caverns, NY. This became the first evidence of WNS in the US. By the time the fungus was officially identified as a new species of cold-loving fungus in 2009, and named Geomyces destructans, WNS had plowed through northeastern caves and had spread as far south as Virginia. ​For the last few years, biologists have watched thousands of bats fly into their caves and mines for hibernation, knowing that tens of thousands probably won't fly back out. "The worry is great, tremendous," says Greg Turner, a Pennsylvania researcher specializing in endangered mammals. By late winter the reports start coming in of the latest areas with confirmed WNS cases. It's a horrible feeling waiting and every few days hearing of yet another colony of bats that has disappeared or another state that has been infected. In 2011, cases of the mysterious disease were confirmed for the first time in Ohio, Indiana, North Carolina and Kentucky and in the Canadian provinces of New Brunswick and in Nova Scotia. So far, a total of 18 states, mostly in the eastern U.S., and four Canadian Provinces have been confirmed as infected. ﻿What is WNS? How does WNS relate to Geomyces destructans? Why bats? 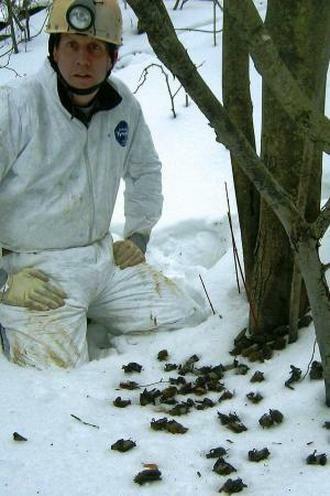 Pennsylvania Game Commission Biologist Greg Turner checks dead bats outside an abandoned coal mine. 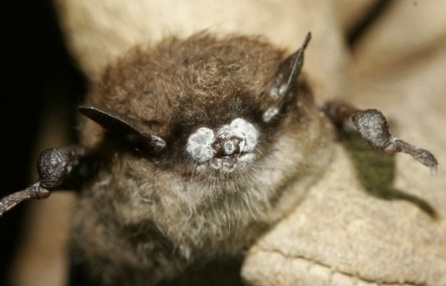 Photo Credit: Kevin Wenner/PGC 2009, PA.
P. destructans can be thought of as a cave disease that uses bats as a kind of substrate on which to grow. It is a pathogen that can persist in a cave environment without the need for “host organisms” to stay alive; but the fungus does need a host in order to grow, and for P. destructans, the preferred host appears to be bats. It is possible that other species may contract spores of P. destructans, but these other animals do not provide a proper substrate for the fungus to proliferate and are therefore not vulnerable to WNS. Why are bats a good substrate for P. destructans? The fungus is “cold-loving” and thrives between 41-50F. It is very unusual for a fungal infection to cause a warm-blooded animal to become sick, but the fungus strikes during the cold months when the bats are in their hibernacula in a state of torpor with lowered body temperatures. At least six species are affected: the Little Brown Bat, Big Brown Bat, Tri-colored Bat, Northern Long-eared bat, Small-footed Bat, Virginia Big-Eared Bat and the Indiana Bat (the latter two are listed as endangered). Though the fungus seems to prefer the 25 species of hibernating bats, each of the 45 species of bats in the United States and Canada may be susceptible to WNS. The Little Brown Bat, the most abundant species in the regions currently affected by WNS, has experienced particularly dramatic population losses. How did P. destructans appear in Howe Caverns? The fungus appears to live in European caves without affecting bats. It is possible that the fungus was inadvertently carried on the clothes of a European tourist who went for a tour of the caves and may have brushed against a cave wall, depositing and leaving fungal spores behind. Support for this hypothesis is the finding that the fungus cannot be killed by simply washing clothes. How does WNS kill bats? WNS causes cellular changes that affect the function of the skin on a bat's face and wing and tail membranes; research suggests that this may affect the bats in two deadly ways. Initial research indicated that the fungus may irritate the bat's skin, rousing the animal from torpor. As much energy as 30 days of hibernation is consumed each time the bat wakes up. In order to redress this energy need, the bat moves towards the entrance of the cave to look for food, but they find that it is still winter and there is no food, and no warmth. The bat dies of starvation and cold. But new research has demonstrated that it may be thirst and not hunger that is causing infected bats to wake up and move towards the entrance of their hibernaculum. Though the white muzzle of infected bats is the most obvious sign of the disease, it's actually the wings that appear to be particularly susceptible to the invasive fungus. Scientists believe that the way P. destructans invades bats' wing skin is unlike any known skin fungal pathogen in land mammals. The fungus digests, erodes and invades the skin by sending its tentacles through dead surface skin and into living dermis tissue - dissolving that tissue and using the liquid to feed itself. A cross-section of a bat wing infected with P. destructans. This picture shows characteristic cup-like epidermal erosions filled with fungal hyphae (the long, branching filamentous structure of a fungus, that are the fungi’s main mode of vegetative growth), as well as ulceration and the invasion of underlying connective tissue. In this case, the fungal invasion spans the full thickness of the wing membrane. Fungal hyphae can also fill hair follicles and destroy skin glands and local connective tissue. Bat wings provide a large surface area for the fungi to colonize and grow, and once the wing is infected there may be a catastrophic disruption of homeostasis during hibernation, leading to the death of the infected bat. From Blehart et al. (2011), Microbe Magazine, June 2011. But this does more than limit a bats ability to fly. Apart from enabling bats to perform amazing aerial feats, the bat's wings are also involved in many roles of homeostasis, such as regulating body temperature, blood pressure, water balance and blood and gas circulation and exchange. P. destructans interferes with the physiological functions performed by the bat's skin causing a “catastrophic disruption” in these functions. UPDATE: this graph from a recent paper illustrates how P. destructansaffects infected bats. From: Verant et al. 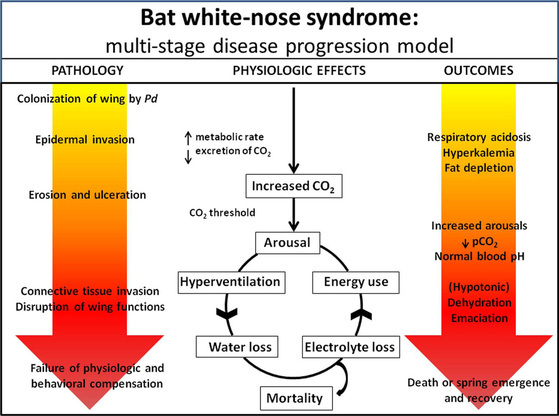 (2014), White-nose syndrome initiates a cascade of physiologic disturbances in the hibernating bat host, BMC Physiology 2014, 14:10. ​Why are hibernating bats particularly susceptible to P. destructans? ​1. The body temperature of hibernating bats is in the range of maximal growth of the fungus. 3. Behavioral strategies and adaptations that have evolved to maximize survival during hibernation, such as dense clustering in humid areas of a cave, may also enhance fungal growth and increase the infection rate. Why does WNS result in such a severe mortality rate? ​1. As outlined above, whether the bats wake up during torpor because of hunger or thirst, constant arousal during the winter months when there are limited resources is a death sentence. 2. P. destructans also destroys hair follicles, and sebaceous and apocrine glands. This disrupts protective secretions that moisturize and water-proof skin, and may provide a protective barrier against harmful microorganisms. Additionally, the secretions may supply nutrients to symbiotic, and possibly protective, microorganisms. “The ground is littered with bat bones. There are so many of them- thousands upon thousands - that you can't take a step without crunching them underfoot." -Elizabeth Kolbert, on the Aeolus Cave, Vermont. 3. P. destructans may also disrupt blood circulation, affecting core body temperature. Warmed blood could quickly lose heat through infected wings, and this means that the bat must use even more energy rewarming during arousals, which depletes even more fat reserves. In this way, wing damage creates an unsustainable cycle of energy loss. ​4. 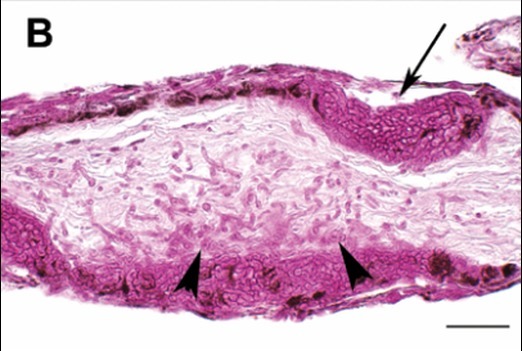 Cutaneous respiration may also be impaired by P. destructans. During torpor this kind of passive gas exchange may be critically important when respiration rates are low. If this ability is impaired, compensation may occur by increased respiration by the lungs, leading to additional water loss. ​Why do some species appear more susceptible to WNS than others? Despite exhaustive efforts by American wildlife rehabilitators and veterinarians, most bats who contract WNS do not recover (see box, “What are Wildlife Rehabilitators doing about WNS?”). Even when the wings don't look too bad to the naked eye, a look under the microscope often reveals deadly damage already starting to take hold. This suggests that bats may be suffering more than we currently appreciate. If a bat does survive WNS, will it be OK? It is possible that injured wings, even if healed, may result in decreased flight ability and efficiency. Compromised wing structure and muscles may make wings unstable and harder to control in flight. 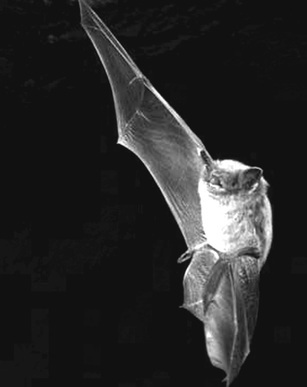 Damaged sensory nerves may diminish the ability to sense airflow across the wing's surfaces, resulting in a decreased ability to control flight; and with compromised flight, the bat is more vulnerable and less able to survive in its environment. A healthy Little Brown Bat in flight. Photo by M. Brock Fenton. No worries here! White-nose syndrome does not affect people. The fungus would never grow on human skin, it is too warm. Bat's are at risk because when in torpor, their body temperature will drop to within a degree or two of the cave's temperature, which brings the bats within the fungi's ideal temperature growth range. Why are bats important to humans? Bats may be the most under-appreciated mammal on the planet. As a top predator of flying insects and as pollinators, bats serve an important role in the ecosystem. These little animals are voracious predators, consuming up to their body weight a night in flying insects. These insects include many human, agricultural and forest pests such as mosquitoes, moths and beetles. By reducing the numbers of pests, bats help reduce crop damage and the use of insecticides. Bats also serve as pollinators and seed disseminators for our crops. Without bats we face significant environmental and economic consequences. As bats numbers dwindle towards extinction, farmers may start finding themselves without a major ally in the war against pests. Several species of bats can eat up to 1,200 insects an hour, or about 3000-7000 insects a night. One researcher compares this to a human eating 50 pizzas a day! The loss of the one million bats in the Northeast over the last 5 years means that there are between 660 and 1320 metric tons of insects that are no longer being eaten each year by bats in this region. This appetite for insects may make bats the most overlooked non-domestic economically important animal in North America. Bats enable organic farmers to grow food successfully without chemicals. But even non-organic farmers save millions of dollars every year by the bats' pest control services. In the U.S. alone it has been estimated that the pest control service provided by bats to agriculture range from a low of $3.7 billion to a high of $53 billion a year. As increasing numbers of bats succumb to WNS, scientists have predicted that within 4 to 5 years noticeable economic losses could occur to North American agriculture. This may be particularly true in the Northern Regions of the US, where agriculture is a multi-billion dollar industry, accounting for about 20% of all jobs across North Dakota, Montana and Idaho, and cold winters make it a perfect place for the fungus to take hold. In these areas, the estimated annual value of bats is nearly $2.7 billion (nearly one-third of the market value of crops sold in these states). For these economic reasons, the USDA Forest Service is considering closing caves in North Dakota, Montana, north Idaho, and northwest South Dakota. As one regional forester comments, “I don't believe we can approach this issue with a wait-and-see attitude, once one cave in the region is affected, the likelihood increases for a more rapid spread among the bat population” (Leslie Weldon, U.S. Forest Service). A Little Brown Bat hanging in its hibernacula and showing signs of White-nose Syndrome. Photo credit: from WV Department of Natural resources website. ​​Apart from agriculture, bats play a pivotal role in keeping us healthy. The U.S. Forest Service has estimated that in the U.S. there are already 2.4 million more pounds of insects each year due to bats who have succumbed to WNS, and that this number will grow exponentially each year. As the distributions of insects carrying diseases like West Nile virus, malaria and dengue fever continue to grow, our health is already at risk. But now, not only are there more insects carrying more diseases, but because of WNS there are fewer bats to eat them, and this could precipitate a major health crisis in the human population. What are the scientists doing? WNS is something entirely new; a fungus that kills a mammal and moves through a population and across geographic locations with great speed. The illness is sweeping across America so quickly that scientists are struggling to understand the fungus and counter its destruction before all of the bats are gone. 1. Bats are at high risk of being infected with P. destructans during the winter then their bodies are in torpor. At this time their immune systems are suppressed and their bodies do not fight off the fungus. Scientists examining infected tissue find that there is no inflammatory response to the infection. Though the lack of response may occur when the immune system is repressed it can also occur when the body does not recognize the infection as a foreign agent. The geographic range of the Little brown bat, taken from Fenton & Barclay (1980). By looking at this map, it is clear that if P. destructans continues on its devastating path, many more bats will succumb to WNS. 2. It appears that WNS is primarily transmitted from bat to bat, but fungal spores may be inadvertently carried to caves by humans on clothing and caving gear. It is unclear whether bats are still infective during the summer or if it is possible that the disease will spread to tree bats. If transmissible during the summer months, it is very possible that maternity roosts, where large numbers of bats gather during the warmer months, are a primary target for WNS infection. This might also account for the spread of the disease as bats who spend the summer in one state, but winter in another, can carry the fungus to their winter hibernacula initiating the spread of WNS in a previously unaffected area. ​Similarities between the two fungi also suggest that it may be difficult for American bats to evolve a resistance to WNS. Though some researchers believe that evolving a resistance to the fungi is the best hope for American bats, like B. dendrobatidis, P. destructans may work too fast for evolution to save bat species from WNS. Bats normally live over 20 years and have only one offspring per year, which means that it will take a long time for bats to evolve resistance to this rapidly killing fungus and even longer for bat populations to recover. Some have estimated that even if the mortality were to end now, it could be hundreds of years before populations rebound to pre-WNS numbers. Over 200 species of frogs have declined or gone extinct; this is the greatest rate of loss due to disease in recorded history. We can only hope WNS does not follow a similar pattern. What's the plan to understand and tackle WNS? ​1. As the deadly fungus spreads across the United States, collaboration is essential in order to mount a collective response to save the bat species from decimation. There are another 19 species of bats in the US who are obligate hibernators, and therefore have an increased risk of infection by P. destructans. In May 2011 The US Fish & Wildlife Service implemented a national management plan to address the threat posed by WNS. The national plan provides a framework for coordinating and investigating the cause of the WNS and is a cooperative effort with state and federal agencies, researchers, tribal land management agencies, universities and non-government organizations. Working together, sharing resources and information, the plan offers guidance to agencies as they make decisions related to managing their response to WNS. It also outlines the actions necessary for state, federal, and tribal coordination, and provides overall strategy for investigating the cause of WNS and for finding ways to prevent and manage the spread of the disease. Additionally the national plan aims to create an adaptive implementation plan to identify more specific actions needed, the entities responsible for implementation of each action, and cost estimates. The plan is designed to be a “dynamic document” that can be quickly modified in response to new information. “This is an issue that will take the efforts of all state, federal and tribal land management working together with partners, researchers and those in the recreational caving community,” says one official. “With everyone's assistance we hope to slow the spread of this disease” (Leslie Weldon, U.S. Forest Service). US Fish & Wildlife's national plan does not currently have any funding associated with it, though having it in place may help secure some federal money for research. At press time, they announced that this year, up to $1 million will be available for high priority research projects related directly to the investigation and management of white-nose syndrome (WNS). 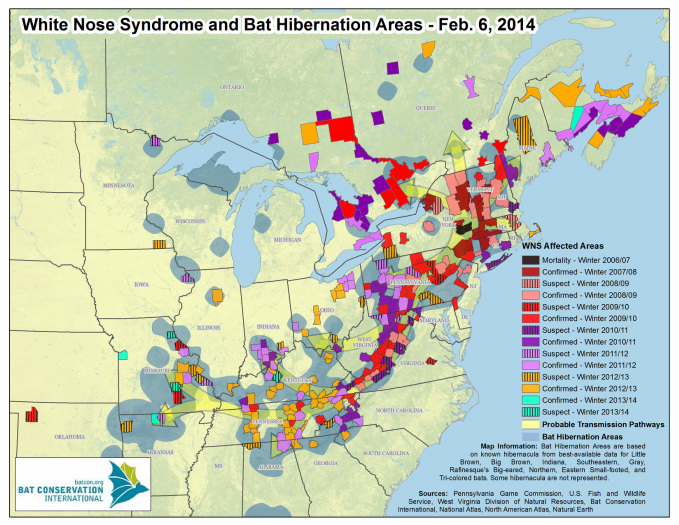 ​The full plan and additional WNS information available is at White-nose Syndrome.org: A Coordinated Response to the Devastating Bat Disease. Since its first appearance White Nose Syndrome has spread in all directions at a frightening speed. Map from Bat Conservation International. Latest map from the US Fish & Wildlife Service showing the spread of WNS across the US. See http://whitenosesyndrome.org for more information. 3. In America, bats appear to be a perfect host for P. destructans, providing nutrients, an ideal environment and offering virtually no resistance to the fungus. But P. destructans exists in Europe and does not appear to infect European bats. By comparing European bats and N.American bats, scientists hope to find out why N.American bats are so susceptible to the fungus and why the fungus is so “amazingly destructive” in this part of the world. European bats may have differences in behaviors, immune responses, susceptibility to water loss, skin secretions or symbiotic organisms that make them more resistant to WNS. European bats are also larger than their U.S. cousins; and as P. destructans depletes the fat stores in the small U.S. bats, larger bats with increased body mass may have greater ability to survive fungal infection. Additional research may also reveal that the American fungal species has subtle variations that make it more virulent than the P. destructans found in Europe. Or perhaps there are subtle temperature and humidity differences between American and European hibernacula that influence the virulence of P. destructans. As researchers find out more about P. destructans, they hope to find a “weak link” of the fungus that can be targeted in order to stop the infection and decimation of American bats. 4. Videos are being made of bats in affected caves to study to study how the fungus may cause fatal changes in behavior. 5. Additional studies are looking at placing heaters in caves, studying bats' genetic susceptibility to the syndrome, and investigating ways to decontaminate caving gear, so that the fungus is not carried from cave to cave by spelunkers. 6. Scientists are testing fungicides that might rid caves of P. destructans. However, there is a fear that fungicides may kill other microbes in caves, perhaps setting off a chain of unintended consequences. ​7. In Tennessee, the Nature Conservancy, Bat Conservation International and the University of Tennessee Knoxville are building an artificial cave free from fungus in an effort to entice bats from nearby colonies to switch homes. If successful it is possible that artificial caves could be located in areas with badly infected natural caves. The infected caves could be closed until researchers learn more about managing the fungus, and in the meantime the bats would have a healthy place to live (see picture to the right). 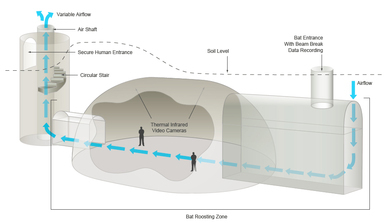 The Nature Conservancy in Tennessee’s proposed artificial bat cave. ​​8. Many states as well as the U.S. Fish & Wildlife Service are considering extending endangered species protection to the species of bats most at risk of WNS. Though the listing will not necessarily address or solve the biggest threat to these bats, namely the disease itself, species listed as endangered may receive more funding for research. Additionally, listing a species as endangered is often followed by the development of a recovery plan and the designation of critical habitat for the species. Endangered species protection also gives these species “a voice” in the U.S. political and legal systems and increases public awareness and support. In July of 2011, Vermont added the Little Brown Bat along and the Northern Long-Eared bat to Vermont's Endangered Species list. 9. On the political end, U.S. Senator Frank R. Lautenberg (D-NJ) introduced legislation to create a federal plan for responding to wildlife disease emergencies. This bill is supported by several wildlife advocacy groups as it will give scientists more tools and funds to mount a response to devastating wildlife diseases like WNS. Senator Lautenberg also helped WNS research receive an essential $1.6 million in federal support last year. This year, the US Fish & Wildlife Service recently announced that they anticipate up to $1 million will be available for research projects related to the investigation and management of WNS. ​1. If you find a bat flying in your house, do not use violent measures to evict her. Bats can get in any tiny opening in your house and may get disorientated, desperately flying around to find a way out. Open a window and the bat will usually find her way out on her own. You may also, very carefully for everyone's safety, catch the bat in a towel and release it outside, or cover it with a container, slide on a cover and let her go outside. 2. Put up a bat house on your property to ensure that these animals have a safe place to live and raise young. 3. If you find a bat using your house for hibernation and it is not in the way of human activity, let him sleep if possible. Disturbing his hibernation could be fatal. Come spring, he will find his way out the way he got in. Once he is out, make sure you take measures to seal up any entrances in your house. 4. Stay out of bat caves. Until we discover how the fungus is being spread we need to be very careful about being accidental carriers of the pathogen. 5. If you observe more than six dead bats or large numbers of bats flying outside in the winter report those observations to the organization in your state in charge of Wildlife or to the US Fish & Wildlife Service. In New York state you can contact the Department of Environmental Conservation (DEC) in Albany at 518-402-8924 or fwwildlf@gw.dec.state.ny.us. Do not pick up sick or dead bats. 6. 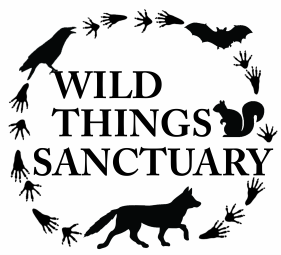 Support legislation that funds bat and WNS research. I hope that this article makes you appreciate that we need to care about bats! As WNS spreads, scientists fear for the enormous hibernation caves in Kentucky and Tennessee where a million or more bats may hibernate in a single cave. Already, states to the west and south of the epidemic are putting precautions into place. In Wisconsin the Big Brown Bat, Little Brown Bat, Eastern Pipistrelle, and Northern Long Eared bat will be added to the state's threatened species list this year in order to provide protection to the bats in the face of the imminent threat of white-nose syndrome. Bats face one of the most significant disease threats to wildlife in history and as scientists race to solve WNS's deadly riddle, let's support our unsung bat heroes! 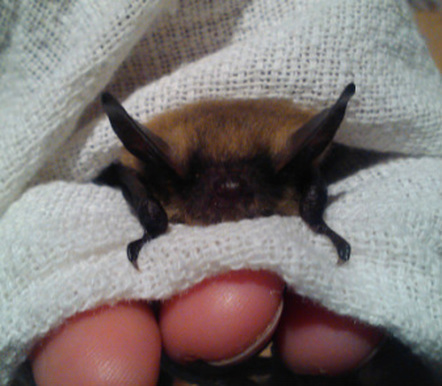 Our Most Recent Bat Patient: This Eastern Small Footed Bat arrived at Wild Things in October 2011. She was found on the ground in the middle of a city, moved to a nearby tree, and was still there after 36 hours. Something was wrong. She came to Wild Things and appeared healthy. Once warmed and fed, she flew beautifully and has been given a large enclosure to allow her to stretch her wings and fly. However, this little bat belongs to one of the species most effected by White Nose Syndrome; with cold weather approaching fast and not knowing whether her hibernacula may have been disturbed or whether she had had trouble during a migratory flight, it was decided that she would overwinter at Wild Things and be released close to where she was found in the early spring of 2012. Thank you to the kind people who looked after her and made sure she ended up in a safe place with lots of delicious mealworms!